If the numbers put out by the Recreational Vehicle Industry Association (RVIA) are any indication, the lure of the open road is getting more enticing by the minute: according to their latest news release, RV shipments reached an 8-year best in 2014, with well over a quarter of a million units sold. 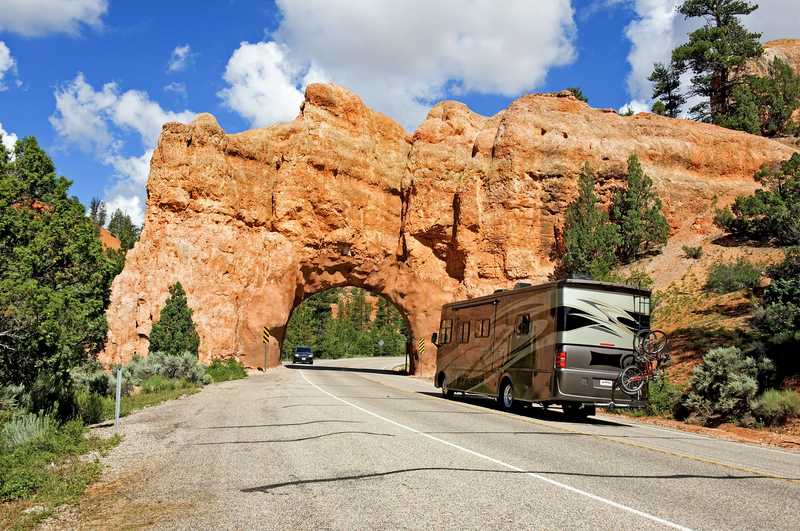 Whether you’re new to the RV lifestyle or a veteran of the highways and byways, you’ll find a little digital help nowadays can go a long way towards enhancing your trip. Below is a selection of travel apps to help you plan, enjoy and make the most of your roadway adventure. Touted as the “ultimate road planner,” this app will help you plan a route, discover fun stuff along the way, sync trips and lists of places between your phone and your computer, save places to share with friends or access later and much more. You can even layer multiple categories onto your trip (obscure attractions, small businesses, historic points, scenic drives, hotels near attractions, etc.) for your perfect getaway. The editors and writers at Oh, Ranger! have compiled a comprehensive database of every federal and state park in America and squeezed it all into this handy little app. Each location features info on available activities find exactly what suits your mood on any given day. Whether its boating, birding, hiking or biking, the app can help you find it. Also included are directions, important phone numbers and even related websites. The American Park Network has an update in the works to allow users to save their favorite places and share them with family and friends. If you don’t have a smartphone you can log into the database by clicking on OhRanger.com. This highly rated camping app helps you find campgrounds, RV parks, truck stops, rest stops, dump stations, RV supplies and even low bridges,with or without an Internet connection. It allows you to find and filter places from resorts to parking lots, all for a low one-time price. Check the weather based on the GPS of your location; search over 28,000 campgrounds in the US and Canada; and much more. Passport America is known as the Original 50% Discount Camping Club since 1992, offering 1,800 locations for members to save while camping in the US, Canada and Mexico. Members and non-members can download this app for free and find a directory of participating campgrounds, RV parks, resorts, etc. The app will find parks based on your current location, and iPhone users can even call the park directly from the listing. Additional features include mapping and saving of favorite locations for future use. This app is powered by consumers like you and me, who report prices at the gas pump and work together to help everyone save money at the gas pump. Since the price of gas is extremely volatile and can vary as much as 20% within only a few blocks, Gas Buddy makes it easy to find the most inexpensive fuel price in your area without you driving around town to find it. Also available for Blackberry smart phones. The SaniDumps RV Dump Station app has the largest up-to-date dump station listings found anywhere. You can quickly find locations for emptying gray and black water holding tanks in your trailer, camper or motorhome. The listings include sites at campgrounds, National, State and Provincial Parks, Forest Service sites, military campgrounds, highway rest areas, sewage treatment plants, RV dealerships and more. User fee, address and GPS coordinates, hours/dates of operation and more. Updated yearly. With over 650,000 in 144 countries worldwide, this nifty app allows you to download all the locations offline so you know how to stay connected when you’re on the road. You can find free or paid Wi-Fi wherever you go using the GPS function on your phone; you can even filter by certain providers and even location type (restaurant, café, hotel, library, etc.) It’s a Skyper’s best friend! Do you have any favorite RV apps that make your day? Love GAS BUDDY – so helpful when we are going through cities to find which exit for the cheapest gas. They need to include “height” as we got caught at a gas station that we couldn’t fit under. While not an APP, http://www.RVillage.com is the fastest growing social networking for RVers and wannabes. And it’s FREE. I have been using Ultimate Campgrounds (www.ultimatecampgrounds.com) for several years and find it has LOTS more locations of all types than the apps mentioned here. It deals strictly with public camping locations of all types: federal, state, county, city, non-profit and more. Whether you want big parks or little hideaway places to boondock, this site has it all. iOS, Mac, and Android apps are available.